As we age, statistically our inactivity will also increase. This inactivity can have a negative toll on our health, ranging from a decline in cognitive function to deconditioning of the body as a whole. Over the decades there have been many theories on how the aging population can still maintain their young mind. 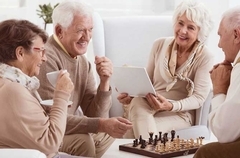 While working on “brain games” such as completing crossword puzzles and learning new skills have been strongly encouraged, there are other ways for the aging adult to maintain a young/health mind. Exercise should come as no surprise, however with the advances in technology along with just keeping up with life, it can be challenging to achieve meaningful exercise. The benefits of exercise are limitless, particular kinds of exercise activities can be selected to maximize positive outcomes. For instance, if an aging adult who is concerned with the possibility of falls, strength conditioning over aerobic activities will help in the prevention of falls. To achieve benefits from exercise the activity does not have to be boring or even a conscious effort. Simple activities such as walking, house work, and gardening are very popular choices among the aging adult population. At Copperleaf Senior Living, we have multiple activity choices, brain games, and exercise courses available for our residents to take part in. We welcome anyone to contact us if they are interested in learning more about the physical activity programs we offer.